Sammuel lives with his mother, father and sister. They live in a small home constructed of cement with a tin roof. They use well water and have electricity. 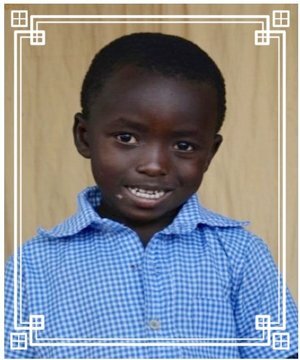 Sammuel's father has physical limitations which have hindered his ability to work and help provide for the family. My name is Kolotioloma Sammuel Soro. I am in CP2 (1st grade). I am happy because the teacher has promoted me to CE1 (2nd grade). My father gave me a gift for the end of the year (New Year’s). My friend came. We had fun and I ate a lot.